My leisurely bike tour of Albany neighborhoods Sunday afternoon took me past Hackleman Park, where I spent a few minutes watching people playing pickleball. If you thought this was a sedate pastime for geezers, think again. The action was pretty lively. They say that anybody between 9 and 90 can learn to play pickleball. Sure, anybody with quick reflexes and the ability to dive for a shot to the corner of the court. It has been described as a combination of badminton, tennis and ping-pong. The players use paddles of wood or composite material to smack back and forth a hollow plastic ball with holes. There are rules, of course. You can look them up online. I first heard about this a few years ago, when the Albany Pickleboard Club and the city’s parks department converted the tennis courts at Eleanor Hackleman Park by repairing the surface and painting on smaller courts. This summer club members have been playing at Hackleman three mornings a week and Sunday afternoons, one of them told me. With winter coming, they’ll move to the Albany Boys and Girls Club. 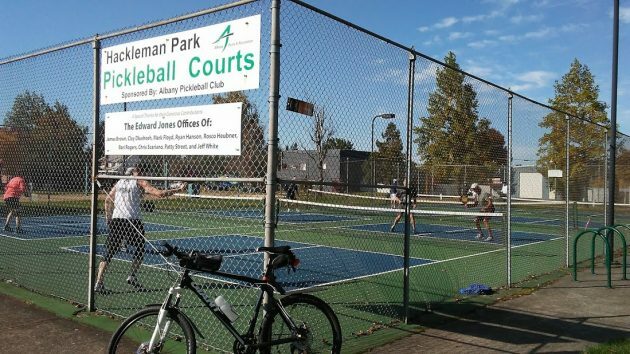 Hackleman Park is Albany’s summertime pickleball center.